Norco's Premium Rabbit Pellets are a complete balanced formulation specifically designed for commercial breeding and growing rabbits. It is suitable for pet rabbit's needing that little bit extra. They contain a palatable blend of cereal grains, vegetable protein meals, lucerne and a complete vitamin and mineral supplement to provide a balanced diet. Levucell (live yeast) is also included to assist in digestive health and improved fibre digestion. Introduce premium Rabbit Pellets over 7 - 14 days. Pregnant & Lactating Does - start at approximately 150 to 180 grams per head per day. Feed intake will increase during pregnancy and lactation. Feed ad lib while monitoring body condition of does to ensure her requirements are being met and feed is kept fresh. Dry Does / Bucks - start at 100 grams per head per day. Feed according to body condition requirements. Ad lib access is recommended for best results provided feed is replaced daily. The Norco Hobby Farm Range is formulated from a selection of the following ingredients: Barley, Wheat, Maize, Sunflower, Sorghum, Wheat Middlings, Vegetable Protein meals, Meat meal (only in marked products), Vegetable oil, Salt, Limestone, Lysinc, Methionine, Threonine, Choline, Molasses, Soybean oil, Cotton Hulls, Chick Pea Kibble, Lucerne Chaff/Meal, Biotin, Magnesium Chloride, Sodium Bentonite, Sulphate of Ammonia, Urea, Magnesium Oxide, Potassium Chloride, Sodium Bicarbonate, Dicalcium Phosphate, Zinc, Monensin Sodium, Ascorbic Acid, Levucell, Norco Vitamin & Mineral Premix. Norco's Goat Pellets are a high specification grain based formulation designed to provide supplementary protein, energy, macro & micro minerals and vitamins in a palatable pellet that will assist in addressing nutritional shortfalls. Medication - Goat Pellets contain 20mg/kg Monensin Sodium for improved liveweight gains and feed conversion efficiency and to help prevent Coccidiosis. DO NOT feed to lactating goats where milk or milk products may be used for human consumption. DO NOT feed to dogs, horses or other equines as it may be fatal. DO NOT feed to Laying hens producing eggs for human consumption. Norco Goat Pellets should be fed up to a maximum of 2% of liveweight and in conjunction with adequate good quality pasture and/or hay. If goats are not used to being fed grain they should be introduced to this pellet gradually. Offer 50grams per head per day to start. Increasing to no more than 1% liveweight per head per day over a period of 7 days and 2% over 14 days. Ensure adequate clean fresh water is available at all times. 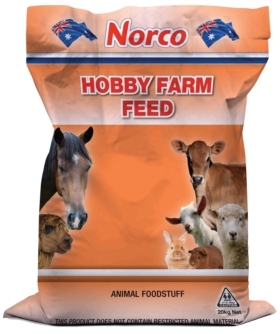 Norco's Hobby Farm Grain Mix is a stock feed supplement for companion Dairy & Beef cattle, Alpacas, Sheep, Goats, Horses and other domestic animals being fed pasture or conserved forage. It can also be fed as a supplement to domestic laying hens over 20 weeks of age consuming garden vegetables, lawn pickings and table scraps, as long as shell grit is also supplied ad lib for egg shell formation. Hobbby Farm Grain Mix contains different sources of energy from cereal grains and seeds, protein from meals, fibre from chaffs and all the macro and trace minerals as well as vitamins A, D, E, K, B1, B2, B6 and B12. Hobby Farm Grain Mix is a supplement and requires feeding along with pastures or other conserved forages. Introduce gradually and over 7 to 14 days increase to desired feeding rates below. Alpacas:- Feed up to 0.5% of liveweight per head per day in conjunction with a forage source. Sheep & Goats:- Feed up to 0.5% of liveweight per head per day in conjunction with a forage source. Cattle:- Feed up to 0.5% of liveweight per head per day in conjunction with a forage source. Horse & Ponies:- Feed up to 0.5% of liveweight per head per day plus a forage source. Laying Hens:- Feed daily with free access in feeders while allowing hens to graze pasture or lawns. Supply Shell grit daily for egg shell formation. Phosphate, Zinc, Monensin Sodium, Ascorbic Acid, Levucell, Norco Vitamin & Mineral Premix. Norco's Horse and Dairy Meal is an economically balanced multipurpose supplementary feed suitable for Ponies and Horses, as well as Dairy and Beef cattle. Horse and Dairy Meal contains a blend of cereal grains, protein meal as well as all the macro and trace vitamins plus vitamins A, D, E, K, B1, B2, B6 and B12. It is ideal for horses in light work or cattle in early show preparation. It does not contain antibiotics, growth hormones, urea or animal-based products. Horse & Dairy Meal is a supplement feed to complement pastures or other conserved forages. Ensure that adequate clean fresh water is available at all times. Cattle:- Feed 0.5% to a maximum 1% of liveweight per head per day in conjunction with a forage source. If feeding over 3kg per day, split into 2 feedings. Horses & Ponies:- Feed up to 0.5% of liveweight per head per day plus a forage source, split into two feedings. Do not exceed 4kg per head per day.